Are Indian startup founders getting reckless? Should there be a code of conduct while communicating on public platforms for young startup founders? Are million dollar founders becoming complacent and over-confident? These are some of the questions which are being asked by industry watchers after a public quarrel between one of the hottest Indian startups, housing.com, and a 23 year old US based venture capital firm went viral. 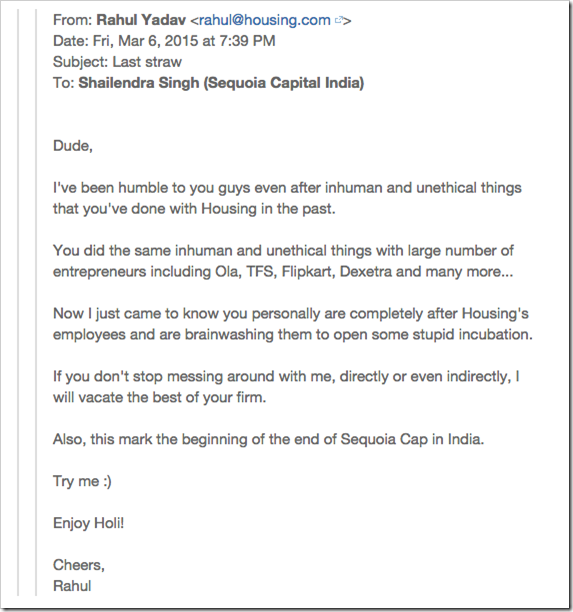 Few days back, a leaked email emerged on Quora thread which was written by Rahul Yadav, one of the nine co-founders of Housing.com. The issue was allegedly the poaching attempt by Shailendra Singh, who is the MD of Sequoia Capital India. 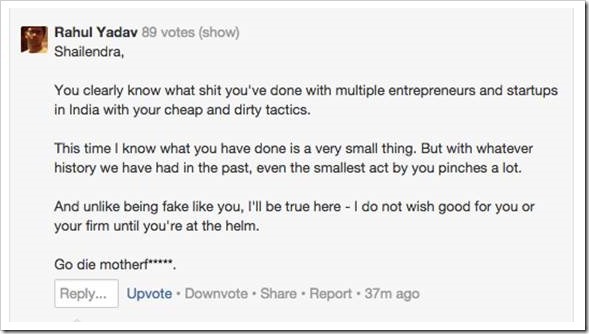 In the end, Rahul is seen threatening Sequoia Capital’s very existence in India. Although poaching of star employees is not uncommon and not entirely a crime which remands such threats, the aggressive and violent way in which the message was conveyed shocked everybody. As if to broadcast the whole effect, this email was tagged to all 1500 employees of Housing.com. Rahul Yadav To Be Sacked? Housing.com has been backed by some of the most powerful and influential venture capital firms such as Soft Bank, Helion Venture Partners and Nexus Venture Partners. The public quarrel, in which Sequoia Capital was directly mentioned, have not been taken lightly by some of them. As per a report appearing in Economic Times, it appears that Rahul Yadav may be ousted as CEO and asked to work only as head of their products department. There has been some disagreements regarding his strategy earlier as well, and after his aggressive behavior appearing in every publication, it seems that the investors’ patience is running out. Housing.com is seeking rapid, all round expansion and their priorities have changed from product to growth. However, Rahul has stated that the rumors are false, and he is there to stay and lead the team. He rubbished claims that any investor has ever said these things. We will keep you updated as more details emerge regarding this matter. Zomato’s Founder Does Reddit AMA, But It Goes Horribly Wrong. Here Are 16 Weird Answers! Sequoia and capital firms like that should not be allowed to take gullible new entrepreneurs for a ride. There should be an association which educates and protects new entrepreneurs. Sachin Bansal’s take was spot on. Sequoia Capital tends to be very adventurous in pitches they failed to bag. It is not only Shailendra but his colleagues like Mohit Bhatnagar and others also have this “Our Way or Highway” attitude. Sacking Yadav would be a huge blunder. There should be an investigative forensic audit on all Sequoia investments starting with Healthkart and I mean it. If Sequoia is caught with their hands in the cookie jar, they must be ejected out of India.